We are to breathe life into your aspirations and to make a mark in the world of style. 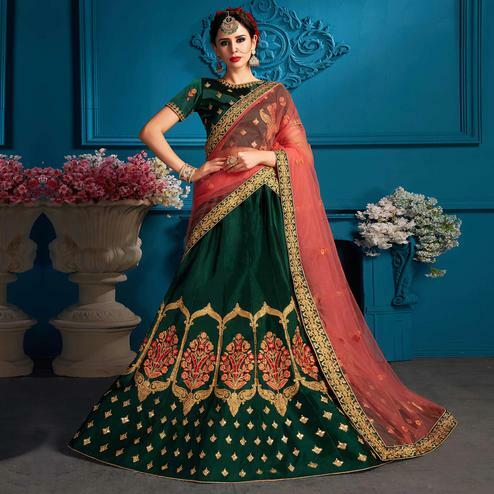 Add grace and charm to your appearance in this beautiful rama green - gajri net lehenga choli. The ethnic embroidered lace resham and zari work within the apparel adds a sign of beauty statement with a look. Available with satin lining embroidered net choli fabric and 60 GM georgette dupatta with lace and butta work. Perfect for traditional functions festivals wedding functions or engagement ceremonies. Pair it with traditional accessories to make your look more beautiful.